Ah, such fond memories. Playin’ pool, with the crack of the balls, the silent concentration with the angles, and the furious cursing when the ball doesn’t go were you wanted or intended. The howling frustration when you lose and your buddy gloats about their win. 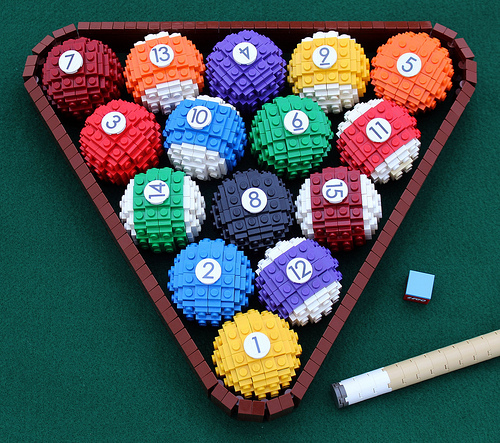 Bruce Lowell‘s posted fifteen fabulously colored and numbered balls, along with a lovely LEGO pool stick. The little chalk-square is a lovely touch. Can’t forget the chalk. The ball technique strikes again!